On Wed 10.23 Hundreds of people took to the streets around the Federal Courthouse sending a strong message of SOLIDARITY about the filing of Detroit’s Bankruptcy and the illegitimacy of Emergency Management. Protest Emergency Management and Illegal Bankruptcy! What: Kevyn Orr and Rick Snyder testimony at Detroit’s bankruptcy eligibility hearing. Who: All Hands on Deck! All Detroiters and supporters of equity and democracy. This decision will impact our schools, our land, our homes and pensions, our resources and our democracy. Why: The world, the nation and our region are witnessing the holes in the story of Detroit’s Bankruptcy and the illegitimate rule by Emergency Management as the eligibility of the largest U.S. municipal bankruptcy filing is determined by Federal Bankruptcy Court Judge Stephen W. Rhodes. 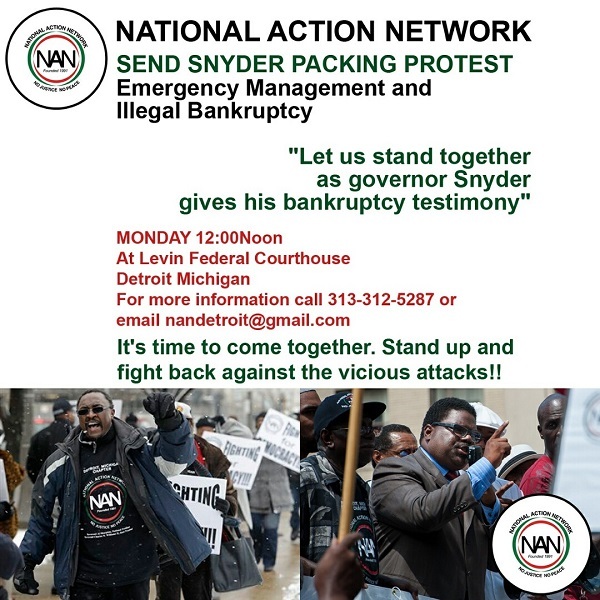 On Monday, October 28th the ongoing bankruptcy eligibility hearing continues with Emergency Manager Kevyn Orr returning to the stand and Governor Rick Snyder scheduled to testify.